LARRIBY. LARRIBY married Alice PARKE. Alice PARKE. Alice married LARRIBY. F i Rebeccda LARRIBY was born in 1684. Shubal STEARNS was born in 1665. Shubal married Mary UPTON. Mary UPTON was born in 1664/1665 in Reading, Middlesex, Massacusetts. She died in Lynn, Essex, Massachusetts. Mary married Shubal STEARNS. M i Shubal STEARNS was born in 1683. Lawrence Decatur GREAVES "Sr" [Parents] was born on 21 Dec 1820 in Franklin, Rutherford, Tennessee. He died on 30 Apr 1900 in Camp Colorado, Coleman, Texas. He was buried in Camp Colorado, Coleman, Texas. Lawrence married Mary Ann Martin MAYES on 10 Sep 1856 in Camp Colorado, Coleman, Texas. Mary Ann Martin MAYES [Parents] was born in 1835 in , , North Carolina. She died on 20 May 1861 in Camp Colorado, Coleman, Texas. Mary married Lawrence Decatur GREAVES "Sr" on 10 Sep 1856 in Camp Colorado, Coleman, Texas. F i Ellen GREAVES was born on 16 Jun 1857. She died on 19 Mar 1932. F ii America "Dink" GREAVES was born on 31 Oct 1859. She died on 22 Jan 1943. Mary Martin GREAVES was born on 8 Feb 1861. She died on 25 Mar 1946. Joseph Decatur GREAVES [Parents] was born in Feb 1795 in , Lincoln, North Carolina. He died in 1824 in , Rutherford, Tennessee. Joseph married Virginia SMITH. Virginia SMITH was born in 1792 in Goochland, Goochland, Virginia. She died in 1922 in , Rutherford, Tennessee. Virginia married Joseph Decatur GREAVES. M i Jonathan GREAVES was born about 1814. F ii Mary Eliza GREAVES was born on 16 Jan 1815. She died on 29 Oct 1874. M iii Robert Smith GREAVES was born on 7 Jul 1817. He died on 4 Jan 1882. M iv Lawrence Decatur GREAVES "Sr" was born on 21 Dec 1820. He died on 30 Apr 1900. Adeline GREAVES was born in 1822. Sidney Decatur GREAVES was born on 10 Jan 1824 in , Henderson, Tennessee. Andrew MAYES was born about 1800. Andrew married Mary Ann MARTIN. Mary Ann MARTIN was born in 1809. Mary married Andrew MAYES. F i Mary Ann Martin MAYES was born in 1835. She died on 20 May 1861. 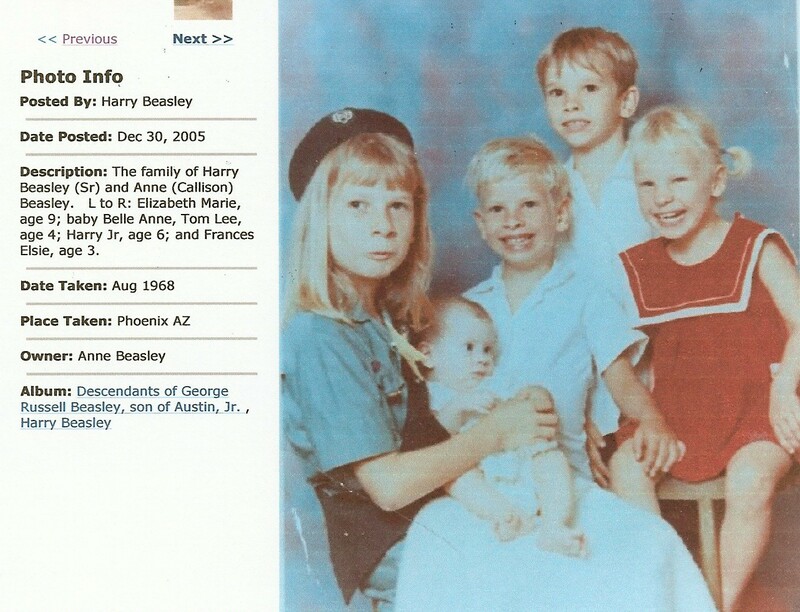 Harry Shipe BEASLEY "Sr" [Parents] was born on 20 Feb 1937 in Dona Ana, New Mexico. He died on 15 Feb 2015 in Phoenix, Maricopa, Arizona. He was buried in Phoenix Memorial Park & Mortuary, Phoenix, Maricopa, Arizona. Harry married Anne Elizabeth CALLISON on 8 Aug 1961 in , Cochise, Arizona. Anne Elizabeth CALLISON was born on 17 Sep 1941. She died on 28 Jan 2014 in Phoenix, Maricopa, Arizona. 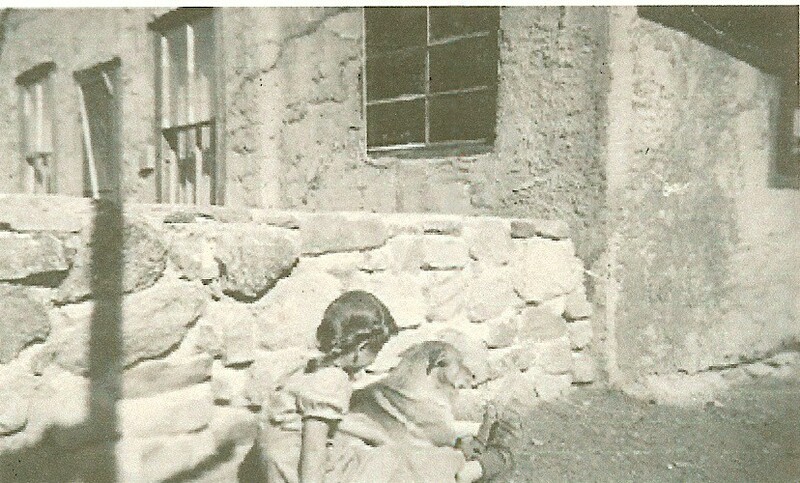 She was buried in Phoenix Memorial Park & Mortuary, Phoenix, Maricopa, Arizona. Anne married Harry Shipe BEASLEY "Sr" on 8 Aug 1961 in , Cochise, Arizona. Elizabeth Marie BEASLEY was born about 1962. M ii Harry Shipe BEASLEY "Jr" was born about 1963. Tom Lee BEASLEY was born about 1965. F iv Frances Elsie BEASLEY was born on 15 Mar 1966. She died on 11 Nov 2011. Belle Anne BEASLEY was born about 1968. Paul McGonagle AVRITT "Jr" [Parents] was born on 4 Apr 1876 in Dyersburg, Dyer, Tennessee. He died on 7 Jul 1956 in Weathrford, Custer, Oklahoma. He was buried in Weatherford, Custer, Oklahoma. Paul married Martha Susan "Mattie" DICKENS on 6 Oct 1901. Martha Susan "Mattie" DICKENS [Parents] was born on 16 Mar 1880 in Enola, Faulkner, Arkansas. She died on 12 May 1970 in Lawton, Comanche, Oklahoma. She was buried in Weatherford, Custer, Oklahoma. Martha married Paul McGonagle AVRITT "Jr" on 6 Oct 1901. F i Vida Vivian AVRITT was born on 17 Jul 1902. She died on 17 Nov 1974. M ii Louis Levi AVRITT was born on 14 Jan 1904. He died on 21 Jan 1987. M iii Lester Gon AVRITT was born on 15 Mar 1906. He died on 5 Oct 1984. F iv Ina Mae "Mimi" AVRITT was born on 12 Oct 1908. She died on 16 Oct 1996. F v Frances Elizabeth AVRITT was born on 22 Sep 1910. She died on 6 Jan 2007. F vi Thelma Sayre AVRITT was born on 4 Jan 1913. She died on 25 Mar 2004. Willis Dickens AVRITT was born on 16 Aug 1915 in Indianapolis, Custer, Oklahoma. He died on 4 Mar 1992 in El Paso, El Paso, Texas. M viii Woodrow Wilson AVRITT was born on 15 Aug 1918. Paul Uriah AVRITT was born on 2 Jan 1921 in Weatherford, Custer, Oklahoma. He died on 20 Sep 1944 in Dejon, France from Probably WW II War Casualty . M x Samuel Jackson AVRITT was born on 2 Jun 1923. Paul McGonagle AVRITT "Sr" [Parents] was born on 22 Jun 1837 in Vanleer, Dickson, Tennessee. He died on 22 May 1909 in Dale, Pottawatomie( Indian Territory), Oklahoma. Paul married Elizabeth BROWNING on 22 Jun 1856 in , Dickson, Tennessee. Elizabeth BROWNING [Parents] was born on 3 Jul 1838 in Nashville, Davidson, Tennessee. She died on 5 Dec 1904 in Dale, Pottawatomie( Indian Territory), Oklahoma. She was buried in Mc Loud Cemetery, Mc Loud, Pottawatomie, Oklahoma. Elizabeth married Paul McGonagle AVRITT "Sr" on 22 Jun 1856 in , Dickson, Tennessee. M i Frank AVRITT was born on 22 May 1857. He died on 13 Apr 1901. F ii Dora Frances AVRITT was born on 15 Apr 1859. She died on 11 Jan 1905. Emily AVRITT was born on 20 Sep 1861. M iv Thomas Clark AVRITT was born on 19 Feb 1866. He died on 22 Nov 1937. M v Richard AVRITT was born on 25 Apr 1867. He died on 25 May 1922. Lillian H. AVRITT was born on 26 Oct 1869. William AVRITT was born on 12 Apr 1872. Happle AVRITT was born on 2 Aug 1874. M ix Paul McGonagle AVRITT "Jr" was born on 4 Apr 1876. He died on 7 Jul 1956. Johnny AVRITT was born on 8 Jul 1879. William AVRITT was born in 1800 in , , North Carolina. He died in 1890 in , Dickson, Tennessee. William married Mary C. HASLEY. Mary C. HASLEY was born in 1815 in , , North Carolina. She died in 1880. Mary married William AVRITT. Silas Richard AVRITT was born in 1822 in , Dickson, Tennessee. Emily AVRITT was born in 1830 in , Dickson, Tennessee. Walter Mathew AVRITT was born in 1832 in , Dickson, Tennessee. W. Carroll AVRITT was born in 1834 in , Dickson, Tennessee. M v Paul McGonagle AVRITT "Sr" was born on 22 Jun 1837. He died on 22 May 1909. Howell AVRITT was born in 1838 in , Dickson, Tennessee. J. Elliott AVRITT was born on 29 Feb 1840 in , Dickson, Tennessee. John BEASLEY "Sr" [Parents] was born on 23 Feb 1755 in Core Creek, Craven, North Carolina. He died on 23 Feb 1808 in Darlington, Darlington, South Carolina. He was buried on 24 Feb 1808 in Darlington, Darlington, South Carolina. John married Margaret Peggy "Millie" SMITH in 1772 in Chersaw, , North Carolina. Margaret Peggy "Millie" SMITH was born in 1755 in , Dobbs, North Carolina. She died on 19 Jul 1817 in Darlington, Darlington, South Carolina. Margaret married John BEASLEY "Sr" in 1772 in Chersaw, , North Carolina. M i William Harvey BEASLEY was born in 1769. He died in 1829. M ii Nancy Pheraby BEASLEY was born in 1770. He died on 29 Mar 1856. F iii Elizabeth BEASLEY was born in 1771. She died in 1831. M iv Solomon H. BEASLEY was born on 10 Jun 1772. He died on 27 Feb 1862. F v Rachael BEASLEY was born on 22 Mar 1773. She died on 7 Apr 1861. M vi Reuben BEASLEY was born on 22 Mar 1773. He died on 12 Sep 1845. M vii Abraham BEASLEY "I" was born on 17 Nov 1778. He died on 5 Dec 1871. M viii Charles BEASLEY was born in 1784. He died in 1838. Richard BEASLEY was born about 1786. He died about 1840 in , , Arkansas. F x Margaret BEASLEY was born in 1786. She died about 1820. M xi John BEASLEY "Jr" was born in 1788. He died on 5 Nov 1821. Stephen BEASLEY was born about 1791. He died about 1851. James BEASLEY was born in 1794. F xiv Nancy BEASLEY was born in 1799. She died about 1851.